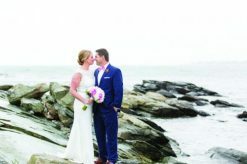 While the couple didn’t start off with a specific theme, by the end of planning their wedding day, which took place eight months after getting engaged, most elements pointed to a coastal beach soiree. 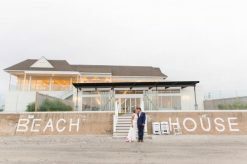 The bride’s family’s Middletown beach cottage served as the ceremony venue, while the reception was located down the street at The Newport Beach House. The creative groom designed and created the starfish boutonnières for himself and his groomsmen, whom he also gifted custom octopus cufflinks. 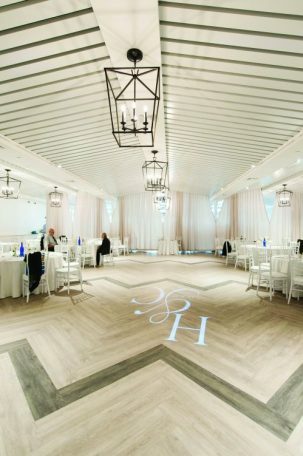 The reception was sprinkled with blue wine bottles filled with twinkling lights and blue and green sea glass. 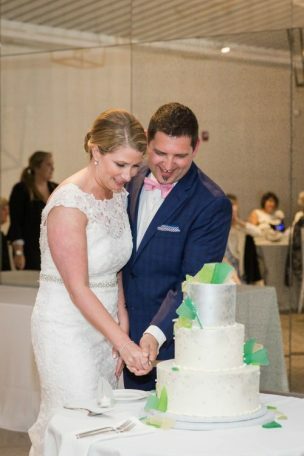 Even the cake was decorated with edible sea glass! A resort in Antigua and Barbuda was the sunny location for the couple’s honeymoon. Afterwards, they returned to their home in New Bedford, Massachusetts, where Courtney is a trade show coordinator for the National Fire Protection Association and Heitor is the lead designer at Niche, Inc.